as i turned from florida avenue hard right onto 11th street and began the ascent up the hill next to cardozo high, i had no clue what beautiful useful gift i would meet at the top. right there on the side of the road at the crest of the hill waba stood with cute little kids waving down bicyclists. yes, i undoubtably do. so i stop and they strap me up with front and back blinking little bulbous lights for riding at night. my safety was doubled in just a minute. what a fantastic surprise. the night only improved. after meeting with old and new friends on georgia avenue i made it back over to 11th street to open up and host the garden open mic. over 50 people came tonight and the energy was super high and lovely. truly bloom-supportive. saria idana was in town from l.a. and graced us with a mini-feature set. desiree bailey, the main feature, was phenomenal. she is an incredible writer. so visual. so crisp. we had many new guests, and returning champions like harvey and javier and natalie e. illum, preparing to go to north carolina for the individual world poetry slam representing d.c. the list was so packed that we went well past 11:30pm this monday night. i think we were able to see 16 or 17 artists perform and per usual it was an ecclectic mix of poetry and music and comedy and o.p.p. and “expression.” although we were all sad to not see my co-host and birthday girl gowri k. i am confident that she will be back at bloom very soon to sing for us all. meanwhile, javier holds it down on the guitar for the intro and outro of the night. i might say a few words too. freeing the style to get us in and out of the night. it’s good. 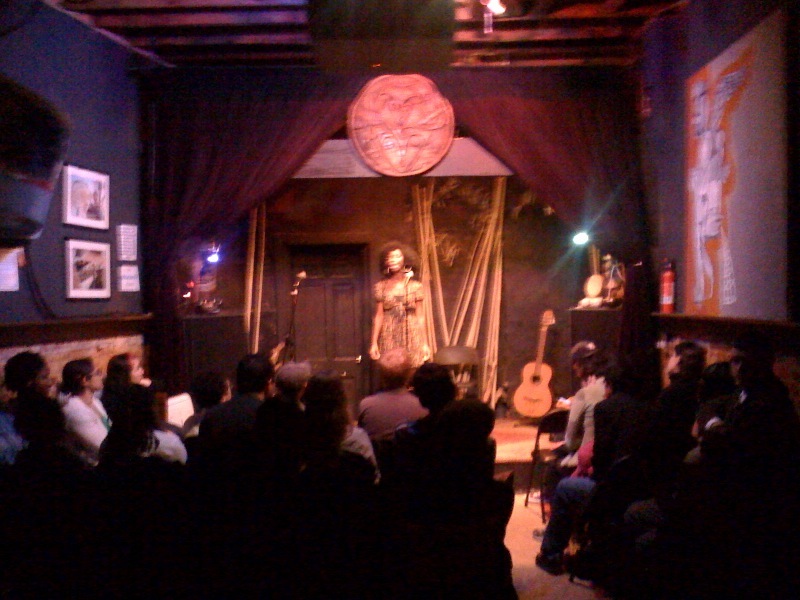 here is a view of desiree performing to a packed house.